Sanguinaccio - what is it? Sanguinaccio derives its name from the Italian word for blood: sangue. 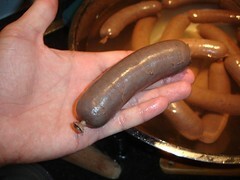 It is a sausage made using the blood of pig or, less commonly, cow. In my mind this is the epitomy of the waste not culture of old where no part of the pig was wasted. I've never been a big fan of it. Growing up we'd eat it every so often during winter as part of meal of "bollito misto", which is a pot of all sorts of meats, boiled and served with potatoes ,cabbage and other cooked vegetables. It always tasted like iron to me. Traditionally, in the Piedmont region of Italy it is made using only blood, mashed potatoes, fat, and spices. Last week my friend told me he was interested in making some, so I offered my assistance. How could I pass up making a salume of my childhood, play with pig blood, AND do it all in his kitchen! Instead of using the traditional Italian recipe, he wanted to give it a French flair, turning a sanguinaccio into a boudin noir, which uses meat,fat,onions, apple and spices. We started by mincing the onions and appled by hand, and quickly turned to a food processor for help. Short pulses made sure we didn't make apple sauce or onion puree. You'll have to drain the onions if you use a processor as it does force water out of them, unlike a knife. 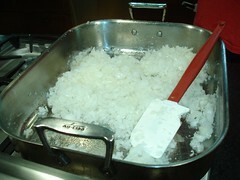 Sweat the onions in 150g of the lard for about 30 minutes until soft. Sweat the apples in the rest of the lard for about 10 minutes. Remove and allow to cool to room temp. Cube the meat and fatback into 1/2-3/4" cubes and place in freezer for about 30-45 minutes. 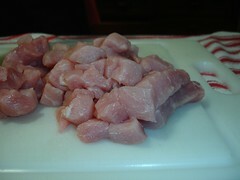 Grind the loin and fatback through a fine plate grinder. 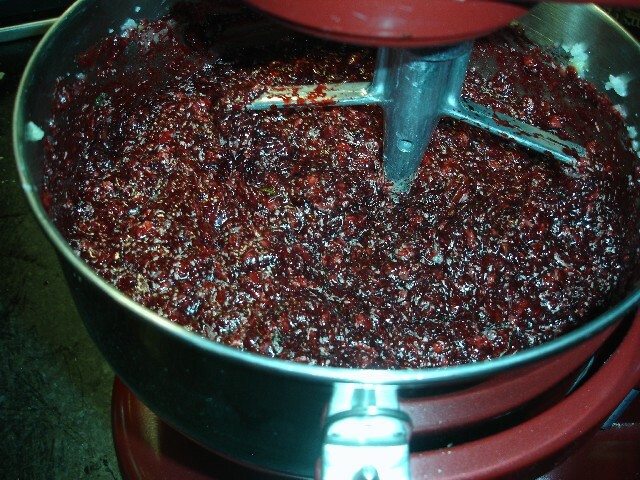 Combine everything except the blood into the bowl of a stand mixer, and mix for about 30 seconds to 1 minute. Add the blood and mix for another 30 seconds- 1 minute to get everything mixed up. Using a funnel on which you've "threaded" some regular, soaked and cleaned, hog casings (29-33mm) stuff this semi liquidus mixture into them, after tying off the end. Try to avoid getting air into the casings as much as possible. This really is a 2 person job. 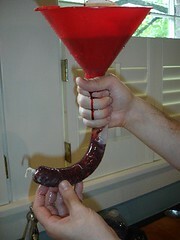 1 person holding the funnel, and the other plunging the mixture into the casings. We used about 4' lengths of casings so they didn't get unmanageable when they were stuffed, and it took us just about 4 of them to use up the mixture. You now have the option of making them into links by twisting at desired lengths, or leaving them as a long coil (you've sealed the ends at this point, after linking). Simmer them in water which is kept at 185-190 deg. F, for about 17 minutes, until the internal temperature is 170 deg. F. Cool them in a bowl of cold water. They are now ready to eat. Either reheated by simmering, or fried in a pan gently. Serve with eggs for an interesting breakfast, or with polenta for Italian style. It would be good with grits too, making it a southern type dish with Italo/French roots. These will keep in the fridge only for a few days, so freeze if you're not going to eat right away. I acually enjoyed eating these. They are not as metallic tasting as I remember, possibly because the original Piemontese recipe doesn't use any meat, and fewer fillers, leaving the blood flavor to come out more. Nice! I'm glad you started this blog. Did you buy the blood from the Chinese markets? So, was it salted already? 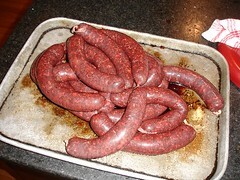 BTW, you still owe me your recipe for Cotechino :-). Elie: Yes, the blood was purchased from an asian grocer, and did have salt in it. Because of that, we reduced the amount of salt we added from 20g to about 10 grams. Thanks for the reminder. I never sent you the cotechino recipe? Hrm..strange, i must have completely forgotten! I'll email it to you this evening if i can. Sorry! 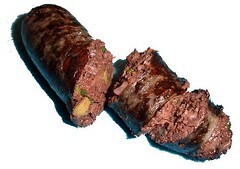 Blood sausage is so good, especially the way the Argentinians make it. I'm curious where the Asian markets get the blood. I've tried for a few years to legally harvest it, but there are just too many USDA obstacles. Keep up the good work Jason! Thanks emile. I'm also curious how the asian markets get it, but it's always easily available there!